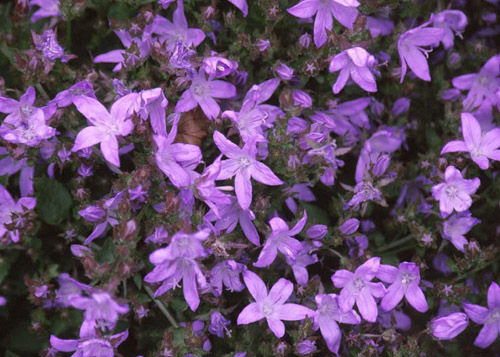 Quickly spreading to form dense blankets of dainty, star-like blue-purple blooms with white centers, Serbian Bellflower is a creeping perennial perfect for the rock garden or sunny rock wall. 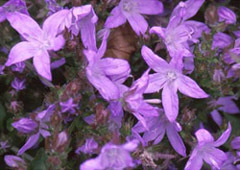 Prefers moist, well-drained soil, but will tolerate drier conditions than most other Campanulas. Starry blooms borne in small clusters on short, slender stems. Propagate by division or separation - Divide in spring or summer. Divide as needed to control spread. Cut plants back to basal leaves when bloom has finished. �Blauranke� (Blue Gown): light blue flowers, 8-10 inches tall, good in window boxes or hanging baskets. �E H Frost�: white flowers, 6-8 inches tall. �Glandore�: Blue star-shaped flowers with white center.